Smells like: A snowy, moonlit night; cold and dark. 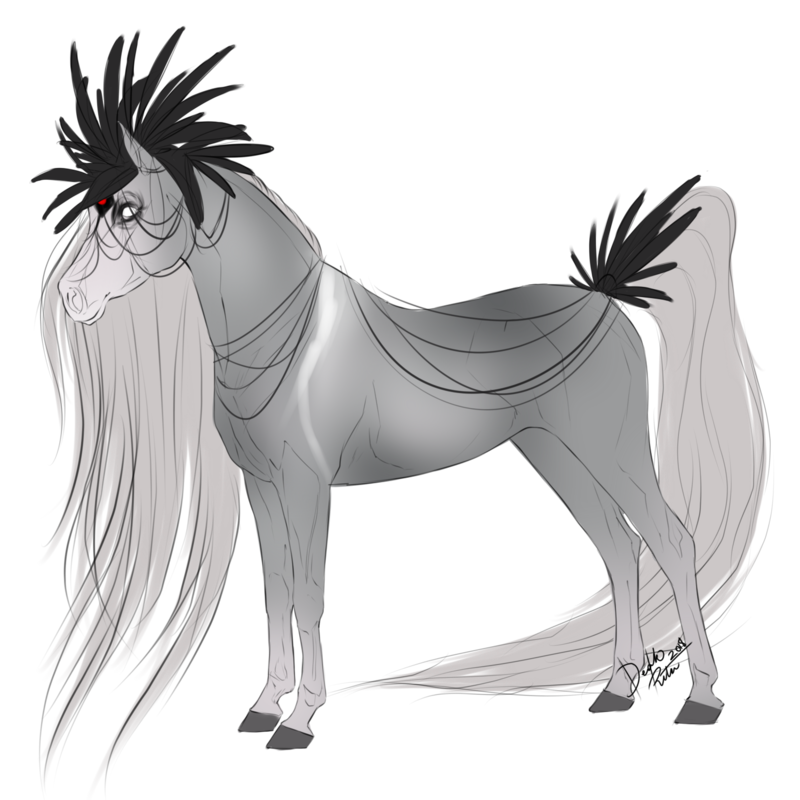 Avarice’s slender form is pinked silver in places but primarily she is a silvered gray with white wrapped around each leg from knee to hoof. 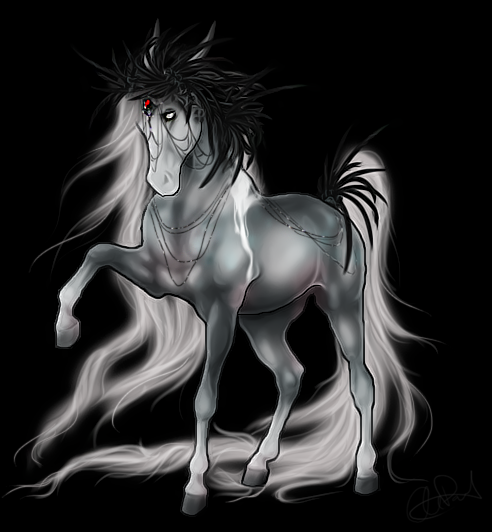 Those hoofs are a lighter gray, almost the same shade as her skin. 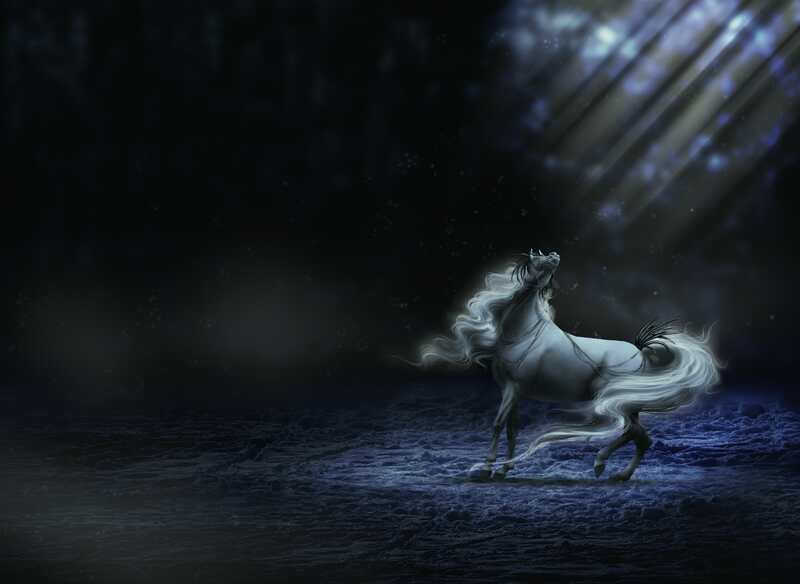 Her mane and tail are both exceedingly long, the purest white in color and they bear an eerie glow. Her tail drags several feet behind her but somehow manages to never catch on anything, the silken length too meticulously groomed to dare tangle. 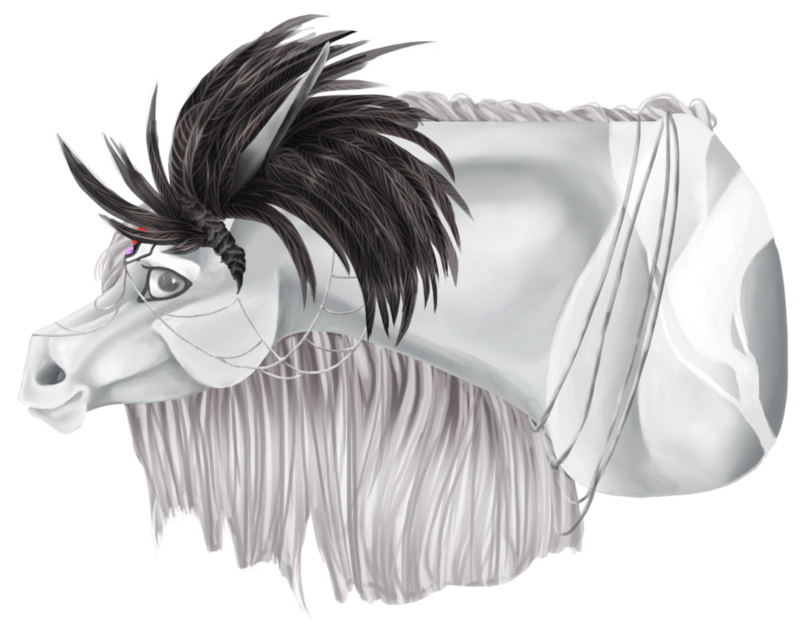 The same can be said for her mane which drapes to meet the ground in some parts while others, closer to the top of her neck, kiss her shoulders instead. Set at the top of her tail is a plume of black feathers with dark silver chains reaching from either side to connect to the base of another, more abundant, spray of feathers in the same color. The chains then drape around her neck to fashion a necklace of sorts but they also run up the cluster of black raven’s feathers a bit before hanging curving up and down around her face. 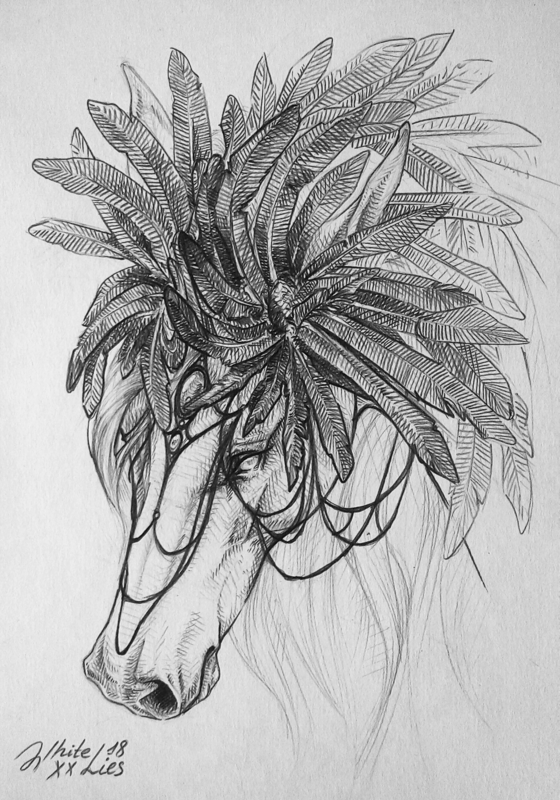 The chains and feathers on her head are held in place by a smattering of skill, magic, and a weighted jeweled piece they are connected to. This jeweled headpiece bears both a large ruby and directly below it, a much smaller amethyst. Her ears are long enough to give her the appearance of horns as they protrude from the myriad of feathers adorning her head. Avarice sees the world through ghostly pale eyes, both pupil-less and cold. Avarice is not a simple creature by any means, she follows no moral guidelines but adheres to her own standards fiercely; though that code is always subject to change. To some, she is coyly sweet, and to others she is doggedly cruel. Her magic reveals the heart of the speaker’s words whether they speak truth, lies, or even half-truths. This has shaped her personality to be withdrawn and distant; she does not wish for many friends or acquaintances as the bitter flavor of their lies leaves her displeased and craving solitude. However, should she decide someone is worth her time and they gain her loyalty; she is unwaveringly dedicated to that individual and will use any means at her disposal to ensure their safety and success. Secrets murmured into her ears do not part from the vault of her mind unless given permission to spread the word, but be warned: lie to her too many times and she is forever closed off from whoever dared try to trick the truthsayer. Much of her history is not known pleasant; her parents were nomadic due to her father’s truthsayer gift. He never developed much control and being in crowded environments caused him to be in intense pain. When Avarice was born and she began showing signs of inheriting his talent, the couple stopped wandering to focus on training her how to never reveal her ability; the kingdom they lived in frowned upon any with magic but especially those who could discern the truth. At least, they despised them if not under the crown’s control for use in his interrogation chambers; but even those who served the crown were treated as slaves. Avarice grew up sheltered and safe until her first birthday…her father had been discovered. Her father was arrested along with her mother for ‘harboring a fugitive’ and they were executed the next day. She never got to say goodbye and on that day, her heart hardened. She fled under the cover of darkness when the moon stayed behind clouds and the snow was thick on the ground; the only way she could successfully blend in with her almost glowing frame. A week into her journey, she came across a sweet older mare who offered her companionship and shelter should she help her get to her destination. A neighboring kingdom where the ruler was not as cruel, it was a dream come true for the young girl. Unfortunately, in her fear for the future, she ignored the bitterness coating her tongue and happily agreed to aid the ailing mare to a new home for both of them. The first and only time she ever ignored the tang of betrayal on her tongue. She knew Avarice was the daughter of the recently executed couple and also knew of the reward offered for the youth’s return; the king desired a young mind to manipulate into his perfect truth detecting servant. Five guards circled the pair and she pressed closer to the elder mare only to hear the horrible sound of her cackle fill the air. She questioned her on a trembling breath only to be called a foolish child and shoved toward the guardsmen. Her actions, however, proved to work in Avarice’s favor as the guards were not prepared for the quick movements upon seeing her shaking in fear. She managed to slide between two of them and bolt into the snowy mountains; the one place her pale coat could conceal her. They searched for weeks, but the darkness of their coats always gave their location away and she stealthily moved from hiding spot to hiding spot; her parents lessons on evading detection swimming to the surface. After several months of hide and go seek with the king’s men, they called off the search due to an uprising by the common equines; they planned to resume their hunt come spring fully believing they’d find nothing but a defrosting corpse. She watched as they filed down the mountain trails and swiftly began making her way toward the border. As the terrain changed and her coat began to become a problem, she took to using natural resources such a clay and dirt to change her appearance while keeping enough of a distance no one could tell it was a disguise. She traveled alone for years until eventually she came across a strange tree, the largest tree she ever saw, but she felt no fear. The soft fog swirling out from one of the cavernous root systems seems to beckon her gently inside the heart of the tree. As she passed through, a strange pull tugged at her heart and she knew her magic was suppressed. Though upsetting, Avarice made the decision to remain in Fimbulvetr as the absence of magic made her useless to the king who murdered her family and security flooded anxious veins. However, in the absence of her terror at being discovered, her hardened heart returned. Avarice is now a primarily cold creature; a true reflection of her coloring, with warmth only shown to those who have earned it or offer her something she desires. Even then, she is often only interested in securing her own wants. Apprentice: A drop of bitterness coats the tip of her tongue; a single clue to the lies the world tells. Accepting the lie for what it is, a dull headache will pierce her temples and leave her with a narrowed gaze for several hours should the lies continue. Adept: The bitterness spreads across her tongue to cement the purest of lies and should she concentrate enough, she can taste a honeyed sweetness mixing with the bitter tang to reveal half-truths. Her headache will grow to wrap around her head while her stomach begins to roll with nausea. A defensive ability begins to develop to counter the price she pays: she sighs and an invisible fog reaches out to those who lie and disorients them via the scent of decay. The more intense the lie, the stronger the fog smells and the worse the disorientation becomes. Master: Avarice has now developed a solid understanding of her abilities which leads to fewer headaches unless she suffers prolonged exposure to lying tongues. However, her focus now extends to a minor ability to block out the magic that flavors her tongue. The defensive fog now expands its capabilities to include a chance of forcing the liar to reveal the truth in their disorientation. Virtuoso: She can now detect lies and half-lies with ease, nausea only returning with exertion; but daily meditation for focus ensures that point is rarely reached. She is also able to completely turn off her ability at will. The invisible fog’s chance of forcing the truth increases as does the disorientation it causes; leaving those who lie to her often on the ground; the scent of decay strong enough to cause them to pass out.